Hi, I’m Liz Jackson. I’m 13 (almost). I’m also a latchkey kid since Mam walked out: now it’s just me and Dad and big-bum Marjorie, oh, and my best friend Bumble (soon to be ex-best friend). Things I love: White Musk perfume, Eminem, pepperoni and pineapple pizza and the pizza delivery boy. Things I hate: the girl next door, my Dad’s lumpy porridge and my gross chin dimple. Things I’m terrified of: my first date (coming up soon), my first date (not long now), and my first date (just around the corner). This is my diary. Anyone who opens it will die a slow and horrible death. 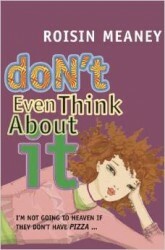 Don’t Even Think About It is part of the O’Brien Press’s new Journal series for girls.